What’s Going On at the Rec? If you’re ever curious about the various activities that are taking place in the Recreation Center, you may find your answer on the Digital Announcement Boards. 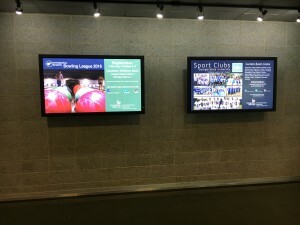 These screens are placed throuhgout the Recreation Center to inform students of current and upcoming events taking place at the Recreation Center, along with information about the different clubs. This entry was posted in Built Environment Descriptions, Images and tagged Built Environment, Built Environment Description, Georgia State University, GSU, GSU Recreation Center, Images, Interior, Photography. Bookmark the permalink.